Mrs. ReaderPants: Genrefication Objection #4: Genrefication is just the latest fad. Genrefication Objection #4: Genrefication is just the latest fad. One of my library's most popular genre sections! Agreed. Dewey definitely does its job well, and I don't think we should go around changing our library classification system willy-nilly. But does that mean we never, ever need to tweak it? Never change it to suit our modern users? The United States Constitution has been around for over 200 years. It works amazingly well, but we still need to tweak it every now and then. We add amendments. We debate controversial cases in the Supreme Court. We write and rewrite and veto laws that help shape our country and the Constitution that guides it. For better or worse, we must adapt our laws to reflect changes in society, technology, voting rights, and values. Like the Constitution, Dewey is a great foundation for library law. But as time marches on, reading habits change. YES. MOST DEWEY SECTIONS WORK. 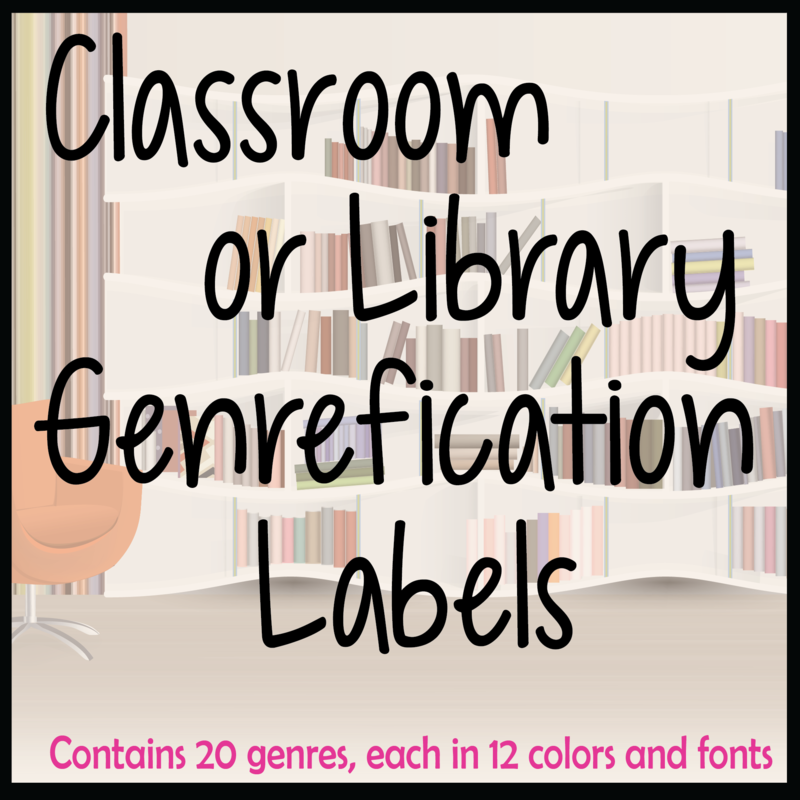 Shelf labels help patrons find books quickly and easily. In my previous school, our library had hundreds of animal books in the 500 section. They took up six 3-shelf book cases. Thankfully, Dewey naturally divided them by animal class--fish, mammal, bird, reptile, insect, arachnid, etc. I was able to label the shelves so that my students could find what they were looking for, and I didn't need to rearrange Dewey at all. Imagine if all the animal books were arranged by author last name only. They are all animal books, but this time, whales are next to orangutans, which are next to mosquitoes. In this case, the subject classification isn't narrow enough. Would browsers find what they needed quickly and easily? What if a patron wanted several books about tigers? They would have to hunt and peck for tiger books among hundreds of other animal books. And don't even get me started on patrons naturally wanting to reshelve owl books with other owl books! My point here is, in the case of the animal books, Dewey worked well. I didn't need to do anything more than add a few labels to the section. It's already "genrefied." Fiction organized only by author's last name, however, is not subdivided by any sort of subject at all. The only labels we can add to traditional Fiction shelves are letter labels to denote the author's last name. Letter labels tell users nothing about the actual book. Sci-fi is next to romance, which is next to historical fiction, leaving users to hunt and peck for the books they really want. Just in the time I’ve been a librarian, the graphic novel section has grown from a couple of shelves in the 700 section to a few cases in a section all of their own. In my library, as in many others I am sure, the graphic novels were overtaking the other books in the 700s. I had split the 700 section into Graphic Novels and 700 two years before I genrefied. It was this split that started me thinking about genrefication in the first place. As with the 700 section, if all "literature" (i.e., fiction) went into the 800 section as with traditional Dewey, the 800 section would take up half of the library. In fact, my Fiction section does take up half my library. Before I genrefied, books for authors starting with M and S and W took up a huge number of shelves. Even if a student knew the author she was looking for, it would still take her several minutes of hunting those sections. In Dewey's time, when there was far less fiction than we have today, putting Literature in the 800s section must have worked. I've visited lots and lots of school and public libraries. The only libraries I've seen without a separate Fiction section are university and specialty libraries, both of which cater to academic rather than leisure reading. Times change, and libraries can and do adjust to reflect those changes. So is genrefication the latest fad? I don’t think so. Fiction is in high demand, and with millions of potential titles available, Fiction sections will continue to grow. As I have stated in my previous Genrefication Debate articles, I advocate for Dewey to mostly remain intact. Dewey still works, just not for today's enormous Fiction sections. Our patrons need and deserve subdivision that means more to them than just the author's last name. My library has over 6000 fiction titles. The shelves take up about half of our floor space. Dewey divided his library into smaller subject sections, which were then repeatedly divided into smaller and smaller subtopics. If Dewey were around today, would he have advocated for one gigantic fiction section with impractical letter subdivisions? Author’s last names are meaningless to many readers. The vast majority of my students don’t know or care who the author of the book is--they just want a scary book. Or a romance. Or an adventure. Fortunately, in my genrefied library, I can point all of these sections out to students. The only hunting and pecking they need to do is deciding which horror book they want to read. Genrefication Debate: Dewey has worked for 150 years. Why change it now?--This post is the first in a series of seven posts debating the merits of genrefication. Here, I encourage librarians to keep Dewey in place when genrefying fiction books. Genrefication Objection #1: If I genrefy my library, my students will not be able to use a public or college library.--This is the first of six common objections to genrefication. Genrefication Objection #2: It's a librarian's job to teach Dewey search skills, not just enable students to be lazy. Second of six common objections to genrefication. Genrefication Objection #3: College professors increasingly report that their students come to college with no research skills.